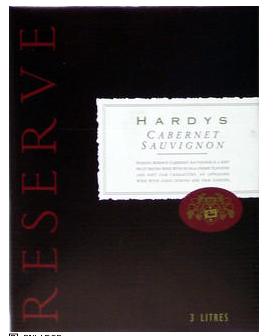 Hardys Reserve “Cab Sav” in a box is easily the most consistently good box wine I’ve found while in Australia. I’ve tried a few other cask brands including some additional varieties from Hardy’s: Sharaz, Merlot and Sauvignon Blanc, but the Hardys Reserve “Cab Sav” keeps coming out on top. Obligatory Description: Hardys Reserve Cabernet Sauvignon is a soft fruit driven wine with distinctive plum & cherry flavors and mild traces of oak. Generally for any seasoned red wine driver they would most likely find it to be appealing wine with just the right amount of tannins and body that will make your tongue purple if you drink enough of it at one sitting. Hardys Cabernet Sauvignon Cask Reserve can be purchased at Dan Murphy’s and the 3 liter box (alcohol equivalent of 32 standard drinks) for $17 AUD.